Hurricanes, fires, floods, and droughts are well-known examples of extreme disturbances that episodically cause high mortality to populations of many species in forest, grassland, coral reef, river, and other ecosystems. Because species vary in their resistance to disturbance, as well as rates of recolonization and recovery, disturbance can ameliorate strong biological interactions and help to maintain populations of species that might otherwise be eliminated by their consumers or competitors. Streamflow is both the most obvious and the most readily quantified disturbance variable in fluvial ecosystems, and as was discussed in Section 2.3.3, flow variability is evident at all scales from the turbulence around a stone to the occasional extremes of major floods and droughts. Thus small-scale disturbance might act almost continuously, whereas larger disturbances occur less frequently. Seasonal temperature extremes, pathogen outbreaks, sediment pulses from bank failure, and the arrival of a novel species each might constitute a disturbance to a particular system. Two major axes of environmental variation that affect stream community structure are environmental harshness and disturbance frequency. These axes are independent, as one environment might be uniformly harsh, a second subject to frequent and extreme disturbances (Peck-arsky 1983). Both act to restrict the abundance and diversity of species that are found at a location, but they differ in that perennially harsh environments such as those that are very cold or highly acid have an ongoing effect, whereas disturbance implies an alternation with periods of more benign conditions. Thus, harsh environments would be expected to contain relatively few species and experience less species replacement, whereas frequently disturbed environments would be expected to contain more species and exhibit higher species turnover. Because strong biotic interactions including competition and predation can reduce species diversity, it may be that an intermediate level of disturbance promotes diversity by ameliorating species effects on one another (Connell 1978, Ward and Stanford 1983). Because individual species differ in their vulnerability to a particular disturbance event, reflecting many aspects of morphology, behavior, and lifestyle, it is important to recognize that the impact of the same disturbance may differ among species (Lytle and Poff 2004). In addition, between-habitat differences occur as a consequence of bed and substrate characteristics, influencing the availability of refuges within the substrate (Matthaei et al. 1999) and resulting in microhabitats where disturbance is less pronounced (Lancaster 2000, Matthaei et al. 2000). 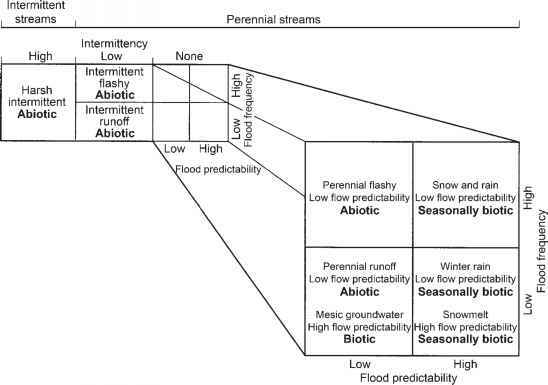 An analysis of flow regimes for the United States (Poff and Ward 1989) offers a useful framing of disturbance in a hydrologic context (Figure 10.6). Using a number of measures expected to characterize flood frequency, seasonal flood predictability, flow intermittency, and overall flow variability, and hydrologic data from 78 stream gauges across the lower United States, these authors identified nine categories of flow regime. Although the exact number of such categories is somewhat arbitrary, the various metrics described in Section 2.4 provide effective means to quantify flow variation. Changes in local and seasonal abundances of the stream biota in response to flow variation received frequent mention in previous chapters. Periphyton, benthic macroinvertebrates, and fishes all can be strongly influenced by fluctuations in flow. In piedmont rivers of the Venezuelan Andes, benthic invertebrates are subject to frequent flash floods during the rainy season and droughts during the dry season. Total macro-invertebrate abundance exhibited a strong negative relation with average monthly rainfall, used as a surrogate of flow because no stream gauges were available (Flecker 1992b). Numbers rebounded during flood-free periods due to colonization and recruitment, resulting in a strong positive relationship between insect abundances and time elapsed since the last storm (Figure 10.7). predation on juveniles (Meffe 1984). In mountainous regions subject to extreme flash floods, however, long-term coexistence of the two species results from the native fish's superior ability to avoid downstream displacement. Hydro-psychids and simuliids exhibit a similar interaction seasonally in coastal Californian streams (Hemphill and Cooper 1983). On hard substrates in fast-flowing sections, black fly larvae are more abundant in spring and early summer, while caddis larvae predominate thereafter. Winters of high discharge lead to greater numbers of simu-liids, and winters of low flow lead to higher densities of hydropsychids. 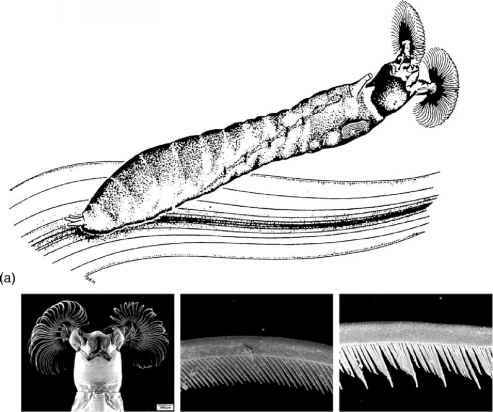 By scrubbing substrate surfaces with a brush, Hemphill and Cooper showed that disturbance benefited simuliids because they were the more rapid colonizers, whereas caddis larvae were superior at monopolizing space on rock surfaces. As time passed since the last disturbance, hydropsychid larvae gradually replaced simuliids due to their aggressive defense of net sites. Because the stream benthos is subject to ongoing turbulence and disturbance, it is possible that the displacement of species through biological interactions may be interrupted routinely, resulting in a continuously shifting mosaic of habitat conditions and species colonization and replacement. This is the model of patch dynamics (Townsend 1989), and it is consistent with the patchy distribution of algae and invertebrates on the streambed (Downes et al. 1998). A fluctuating environment combined with continual dispersal and colonization permits more species to co-occur than would be true if conditions exhibited greater constancy. 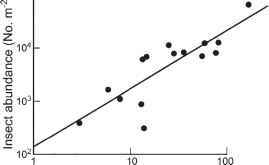 It also confers some regularity to pattern, because environmental circumstances are predictable in the aggregate even though they are unpredictable for any given place and time. Organisms that modify habitat, referred to as ecological engineers, have the potential to influence habitat structure and heterogeneity and thereby affect other species (Jones et al. 1994). The grazing fish Parodon apolineri apparently is such a species, creating observable grazing scars and a patchy distribution of algae and sediments on stone surfaces. By quantifying the spatial pattern of scars in a neotropical stream and by experimentally manipulating densities of Parodon, Flecker and Taylor (2004) demonstrated that grazing enhanced habitat heterogeneity, although with time or at higher densities grazing tended to reduce algae and sediments to a more uniform condition of low abundance. However, the hypothesized correspondence between habitat heterogeneity and richness of the algal and invertebrate assemblages was not observed, perhaps because the timescale at which those taxa respond was slower than the loss and renewal dynamics generated by grazing Parodon. Because flow variation is such a pervasive feature of the fluvial environment, many organisms show adaptation to resist or minimize its effects (Lytle and Poff 2004). Timing of life cycle events such as egg-laying or emergence can be effective when flow extremes have a degree of predictability. The emergence of young rainbow trout from spawning gravel in spring appears to be an example of synchronizing a sensitive life cycle stage with the long-term average dynamics of the flow regime. The rainbow trout Oncorhynchus mykiss, one of the most widely introduced species worldwide, succeeds in new environments where the flow regime matches its native range and fails in other environments where it does not, apparently because floods harm trout fry (Fausch et al. 2001). Position shifts to protected areas are a common behavioral response to high flows, such as the relocation of fishes from the thalweg to the floodplain during a flood event in an Illinois river (Schwartz and Herricks 2005). In arid streams of the southwestern United States prone to flash flooding, giant water bugs (Belostomati-dae) crawl out of streams in advance of the flood, using rainfall as the cue (Lytle 1999). Morphological adaptations including streamlining and other adaptations to minimize drag were described in Section 5.1.4. Disturbance has been shown to have dramatic, ecosystem-wide effects. Examples include those where floods and droughts are of sufficient magnitude that habitat is disrupted and many of the organisms present are displaced, when river basins of different disturbance regimes are compared, and when disturbance most severely affects a species that is a strong interactor within a community. Sycamore Creek, Arizona, is a desert stream subject to extreme flash floods that might occur a few times annually. Fisher et al. (1982) describe the recovery of the system following a late summer flood until another flood some 60 days later restarted the sequence. Biomass of algae and invertebrates were reduced by nearly 100%, but recovery occurred quickly, particularly by the algae, which initially were dominated by diatoms and later by filamentous green and blue-green algae (Figure 10.8). Macroinvertebrate recovery also was rapid, but slower by several weeks than the algal recovery. Nutrient uptake and community metabolism changed over community succession, and this highly productive system began to export surplus primary production. The Sycamore Creek example nicely demonstrates the effects of a disturbance that occurs with unpredictable regularity, and so ecosystem dynamics can only be understood within the cycle of disturbance and recovery. Periodic drought obviously can severely disrupt stream ecosystems as well. Based on an evaluation of resilience and recovery of Sycamore Creek to a number of spates and droughts, Boulton et al. (1992) concluded that droughts had the greater impact. levels during low flow periods). In locations where scouring floods reduced consumer biomass, algal biomass was strongly influenced by nutrient supply, whereas in more stable streams grazers depressed algal biomass regardless of nutrient concentration. The different disturbance regimes identified in this study were clearly a product of regional patterns in geology and precipitation, and so exhibited a degree of spatial predictability. When species that are strong interactors are eliminated or rendered ineffective by disturbance, shifts in disturbance regime can turn trophic cascades on or off. In some California rivers, a grazing caddis larva is abundant during flood-free periods and escapes most predation due to its large size and robust case, but it is highly vulnerable to high flows and rolling rocks during floods (Wootton et al. 1996). During flood-free periods and in dammed rivers, the main energy pathway is from algae to the caddis; however, after flooding occurs in unregulated river segments, more energy flows to smaller grazers and then to young steelhead. In essence, disturbance regime acts as a switch, causing one of two possible food web configurations to become dominant.